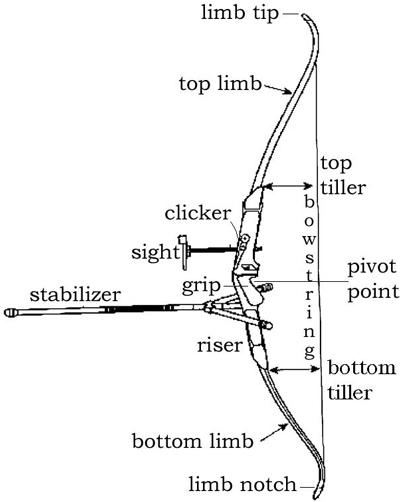 Basic introduction to Recurve Archery bows with detailed explanation and graphics. A recurve bow is distinguished by the outcurves at both ends of the bow. Recurve bows add extra power and smoothness to arrow shooting. Though nobody knows for sure who first invented recurve bows. This bow style is the only archery competition in Olympics. Many archers also use extra powerful recurve bows in field archery, bowhunting and 3D archery. It is widely believed that the Chinese and other Asian tribes have been using recurve well before the native Indians crossed the Bering Land bridge to cross into America, as the later European colonists found native Indians using recurve bows for hunting. Many Horse mounted armies of Mongols, Scythians, Assyrians and Turks used different versions of recurve bows and fought many wars. The modern recurve bows are known as takedown bows as the bow can dismantled into portable parts, unlike the ancient Asian solid single piece bows.